LIBRARY VOLUNTEERS NEEDED: We deeply appreciate the dedication and talents of our volunteers, who are vital for the library to provide its services to the community. If you are willing to share your love of books, language and culture, and want to work with the staff and community members, consider becoming a Library volunteer! 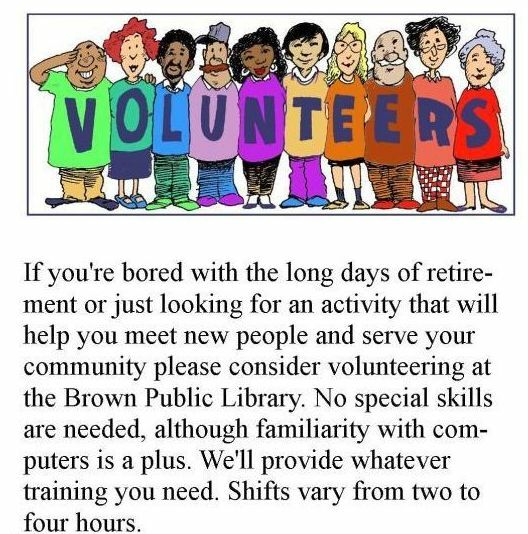 Please fill out the Volunteer Application and submit it to the Brown Public Library, 93 South Main St, Northfield VT 05663.